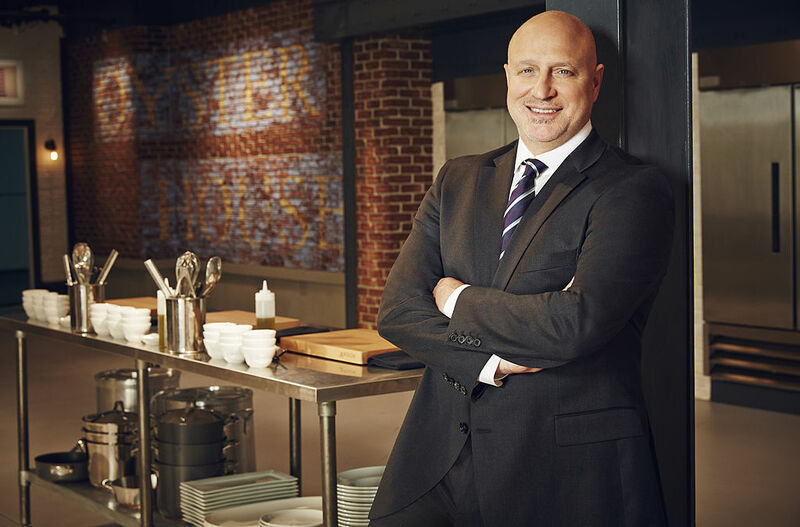 Food Network regular Eric Greenspan doesn’t have to worry about onerous leases or training a front-of-house staff or printing daily menus. 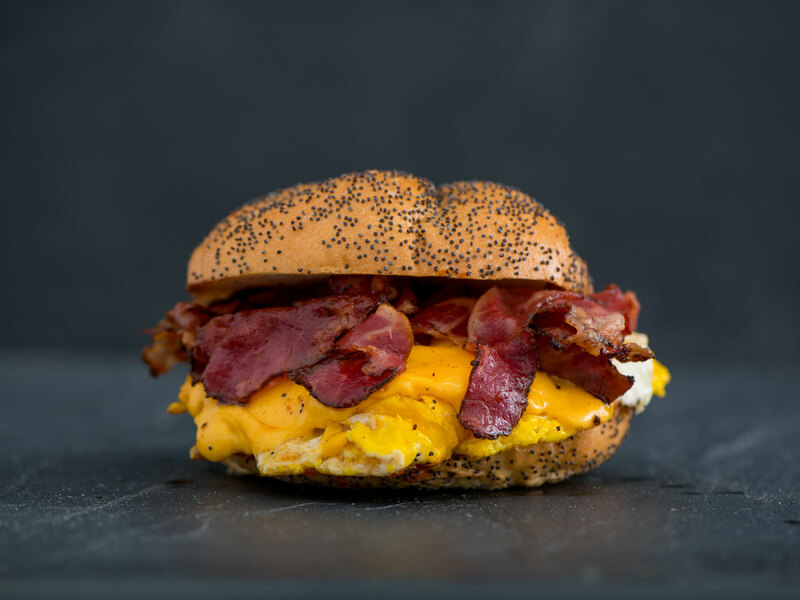 It’s almost 1 p.m. on April 13, and the breakfast rush is over at The B.E.C., which specializes in bodega-style egg sandwiches. But orders are still coming in, so Greenspan continues to griddle bacon and eggs. He started the morning with 270 poppy-seed kaiser rolls, delivered from Röckenwagner Bakery, and he’s down to 38. The B.E.C doesn’t stop serving until 3 p.m., so Greenspan knows he might run out of rolls. It was an intense morning, especially between 8 a.m. and 9:30 a.m., when Greenspan and a couple cooks made around 150 sandwiches. The B.E.C. launched on April 9 with a special 50-percent-off promotion on UberEats for the first week, so there’s been a rush every day. Greenspan, who’s been on numerous Food Network shows and was the host of Eric Greenspan Is Hungry on National Geographic, laughs. He laughs again. Despite burning himself, Greenspan is in a great mood. A delivery-only concept means Greenspan doesn’t have to worry about onerous restaurant leases or training a front-of-house staff or printing daily menus. In the past, Greenspan spent a lot of time in his car driving to his different restaurants. Now, the vast majority of his work is right here, in this little kitchen, where he’s got big plans for numerous delivery-only menus. “One of the things that I love about this is having the opportunity to have multiple concepts and be able to tactilely get my hands on everything,” he says. There’s no downtime at The B.E.C., which is elevating egg sandwiches by making its own pork sausage, chorizo, and chicken sausage. Greenspan, who fell in love with bodega breakfasts when he was living in New York and cooking at high-end restaurants like Alain Ducasse at the Essex House, Bouley, and Union Pacific, gets custom-sliced, thick-cut bacon that he black-peppers himself. Every sandwich is meant to come with ketchup, because that’s what Greenspan prefers, but you can customize your breakfast. Beyond bacon and sausage, there’s pastrami and Niman Ranch ham, the latter of which Greenspan maple-glazes himself. Greenspan and his B.E.C. kitchen crew, Josh McKnight (Greenspan’s longtime catering chef) and Julio Gallardo, also fry smashed fingerling potatoes that they serve with spicy sour cream. Greenspan’s business partner, a mysterious man the chef asks me to call Steve K., stamps delivery bags and checks the board to make sure all orders are fulfilled. Everybody is packed into a kitchen that’s maybe about 250 square feet, Greenspan estimates. It’s a small operation, no doubt, but Greenspan’s got major ambitions for this “incubator kitchen” near downtown L.A. The B.E.C. is the second delivery-only concept that Greenspan has launched here. Greenspan’s Chino, which has orange chicken burritos, bulgogi quesadillas, and carnitas banh mis, started deliveries via UberEats on January 27. Brekkie, featuring oversized breakfast burritos and the “quintessential L.A. egg sandwich with arugula, pesto, and pickled onions,” should kick off on April 30. Then Greenspan plans to launch Boyd’s, a fried chicken concept. His modest kitchen setup includes six burners, the aforementioned 36-inch griddle, a fryer, and a steam table. All he’ll need for Boyd’s is another fryer because he’s got a system where he sous-vides boneless chicken thighs and then flash-frys them. After Boyd’s, Greenspan might do an Italian deli menu, hamburgers, lasagna, or some barbecue, maybe Jewish barbecue. The goal is to have six concepts running simultaneously, with two menus each for breakfast, lunch, and dinner. Greenspan’s kitchen is part of the CloudKitchens facility, which allows both new concepts and established brick-and-mortar operators to open delivery-only outposts. Chef Shruti Patel’s Chai Wallah makes delivery-only Indian food at the the same address. CloudKitchens plans to expand into San Francisco, Chicago, and New York, and this is clearly an era when high-profile chefs and operators are exploring delivery-only options. In L.A., for example, Starry Kitchen was resurrected on UberEats when proprietors Nguyen and Thi Tran were in between restaurants. In New York, David Chang’s delivery-only Ando startup was acquired by UberEats. Greenspan, though, stands out for his goal to develop so many different menus out of one small kitchen. But he’s used to multitasking. Greenspan is candid about why he’s doing delivery-only concepts. For starters, opening a restaurant is a lot more expensive, and he’s had a rough go of it recently. Greenspan is proving that a rocky patch hasn’t killed his sense of humor, but he’s also making a point that he’s not ruling anything out by going delivery-only. If one of his concepts makes sense as a brick-and-mortar restaurant, he might explore it. He admits that he and his partners “grew Maré too fast,” so he needs to make better decisions about whatever he does next. Also, despite all the heat surrounding L.A. dining, the restaurant business remains a minefield. Well-known chefs like Michael Voltaggio, Michael Hung, and Maycoll Calderón all recently closed L.A. restaurants that were open for less than a year. Greenspan knows it’s important to diversify. 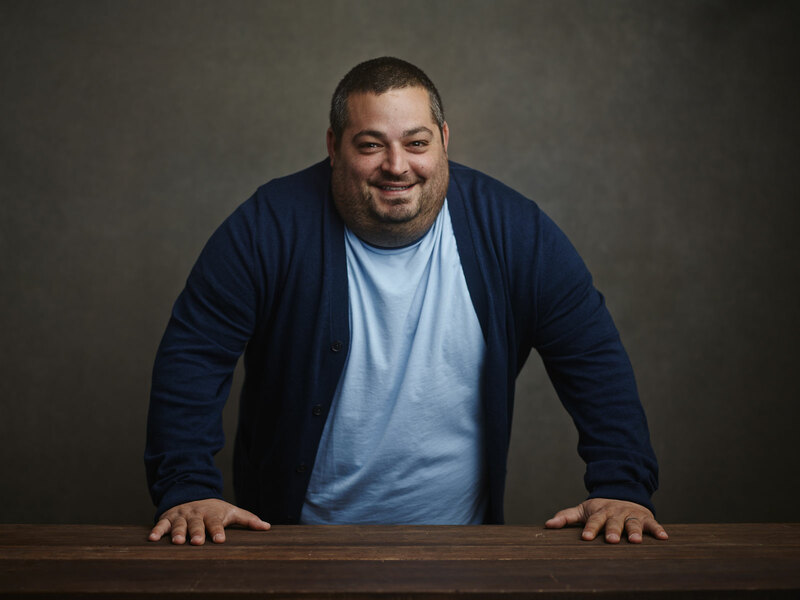 He’s still in charge of the food at The Roof on Wilshire atop Kimpton Hotel Wilshire, and he’s still doing consulting work like creating the new menu for the Brea Improv comedy club. “The reality of it is, I make enough money consulting and doing television and stuff like that to pay my bills and do what I need to do,” Greenspan says. This means he really feels free to experiment at his incubator. And his new schedule also allows him to cook in the morning and early afternoon and then head to preschool pickup. He can hang out with his children at home in the afternoon and put them to bed in the evening before he heads back to work. Meanwhile, he’s not making any compromises while he’s in the kitchen. If anything, he’s optimizing food like he’s never done before. Greenspan, who tested batter for three weeks and then tried different sauces as he tested burritos, is focused on making better delivery food than restaurants that just send out their regular menu items without altering anything to factor in travel time. Greenspan’s not making grilled cheese sandwiches, because he’s learned from experience at Greenspan’s Grilled Cheese that the sandwiches get soggy in transit. He’s also so focused on customer service that he’s spent time texting and calling customers to make sure all is well with their orders. Greenspan can create many kinds of efficiencies in his incubator kitchen. The B.E.C.’s spicy sour cream becomes Chino’s gochujang crema for bulgogi quesadillas. The cole slaw he’ll make for Boyd’s is going to share elements with the Asian vegetables he uses in Chino’s orange chicken burritos. He’s already using chicken thighs for Chino, so he can just increase his daily order once he starts Boyd’s. Brekkie’s burritos will have crispy hash browns, housemade sausages, soft-scrambled eggs, and cheddar cheese. Making those and B.E.C. sandwiches at the same time shouldn’t be too difficult, unless things get really busy. Which is a possibility. On the Friday I visit, Greenspan talks to me for 29 minutes while simultaneously manning his griddle. I text him later, just after 3 p.m., to see if he he has any rolls left.